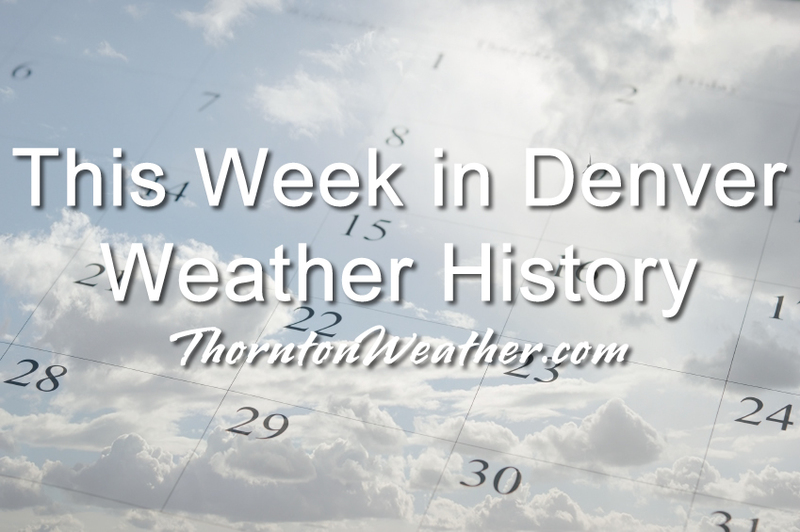 Snow and wind are two common conditions we see this time of year and our look back at this week in Denver weather history certainly has those type of events. Also notable is a surprising October hail storm 13 years ago that went into the books as one of the costliest in history. In 1873…smoke from several large forest fires in the mountains made the air very hazy in the city. In 1871…a terrible wind occurred during a snow storm in the foothills above Boulder. Damage was minor. In 1878…high winds reached sustained speeds of 60 mph at times. In 1911…post-frontal northwest winds were sustained to 41 mph with gusts to 43 mph. In 1948…strong winds struck the Boulder area. Winds averaged 50 mph at Valmont just east of Boulder. Wind gusts in excess of 60 mph were recorded at the Boulder airport. Wind gusts to 40 mph briefly reduced the visibility to 1 1/2 miles in blowing dust at Stapleton Airport. In 1980…a rare October tornado touched down in Boulder… Damaging a vocational training building and throwing three nearby cars together damaging them extensively. A mile and half away several camper vehicles were thrown 200 feet. The storm also produced 1 inch diameter hail in the Boulder area. In 1928…a thunderstorm produced hail shortly after midnight on the 15th. Rain changed to snow by evening. Through the afternoon of the 16th…the heavy snowfall totaled 7.3 inches in the city. North winds were sustained to 23 mph on the 15th. In 1984…the heaviest October snowstorm in several years hit eastern Colorado with a vengeance. The storm was known as the “Bronco Blizzard” since it occurred during a nationally televised Monday Night Football game in Denver. One to two feet of snow fell near the foothills in west metro Denver with 2 to 3 feet in the foothills. Wind gusts up to 55 mph whipped the snow into drifts as high as 4 feet. The storm closed schools…roads…and airports. I-70 was closed both east and west of Denver. I-25 was closed south to Colorado Springs. Flights were delayed for several hours at Stapleton International Airport. Power outages were widespread. Snowfall totaled 9.2 inches at Stapleton International Airport where north winds gusting as high as 40 mph caused frequent surface visibilities of 1/4 to 1/2 mile in moderate to heavy snow and blowing snow overnight. The high temperature of only 35 degrees on the 15th was a record low maximum for the date. In 1989…an autumn snowstorm hit metro Denver with 2 to 6 inches of snow. Snowfall totaled 4.4 inches at Stapleton International Airport where the maximum snow depth on the ground was only 3 inches due to melting and north winds gusted to 25 mph on the 15th. The heavy wet snow caused leafy branches to sag onto power lines…resulting in a number of power outages. Five thousand homes were blacked out in Boulder on the 16th. Up to a foot of snow fell in the higher foothills with 19 inches recorded at Echo Lake. In 1878…high winds reached sustained speeds of 60 mph. In 1998…one of the costliest hail storms to ever hit metro Denver caused an estimated total of 87.8 million dollars in damage to homes…commercial buildings…and motor vehicles. At the time the storm was ranked as the 7th costliest ever. The hailstorm…rare for so late in the season…began over portions of Arvada…Wheat Ridge…and northwest Denver where mostly pea sized hail accumulated up to a depth of 6 inches near I-70. Several accidents were attributed… At least in part…to the hailstorm. Snowplows had to be called out to clear several city streets. The storm intensified as it moved to the east…into the Denver and Aurora areas. Large hail…up to 2.00 inches in diameter pounded east and southeast metro Denver. Two inch diameter hail fell in the city of Denver and at Buckley Field. Hail as large as 1 1/2 inches was measured in south Denver with 1 inch diameter hail in northern Aurora. In 1999…upslope conditions produced snow across metro Denver with heavy amounts in the nearby foothills. Snowfall totals included: 9 inches at Eldorado Springs; 8 inches at Genesee… Golden Gate Canyon…Littleton and near Morrison; 7 inches near Nederland; and 6 inches in Louisville. Snowfall totaled 3.6 inches at the site of the former Stapleton International Airport. In 1990…strong downslope winds raked the eastern foothills. Wind gusts from 60 to 75 mph were common. Strong winds in metro Denver resulted in wave damage to a dock used to moor several private sail boats at Cheery Creek Reservoir. Damage was confined to the dock and two anchor cables. A northwest wind gust to 43 mph was recorded at Stapleton International Airport. In 1878…strong winds reached sustained speeds of 48 mph. In 1988…a wind gust to 62 mph was recorded in central Boulder. The strong winds caused a few brief power outages. An old smoldering brush fire in the foothills west of Boulder was re-ignited by the wind gusts. In 1994…winds gusted to 85 mph atop Squaw Mountain…5 miles south of Idaho Springs. In 2006…a potent storm system brought heavy snowfall to the mountains and eastern foothills. Snowfall totals in the foothills included: 14 inches at Blackhawk…13.5 inches near Idaho Springs…13 inches at cabin creek…12.5 inches at Aspen Springs and Echo Lake…11.5 inches at Georgetown and Rollinsville…10.5 inches near Jamestown…and 10 inches at grant and Lake Eldora. Lesser snow amounts…from 4 to 9 inches…were recorded elsewhere in the foothills. Snowfall totaled only 3.5 inches in the Denver Stapleton area. At Denver International Airport…north winds gusted to 31 mph. In 2012…A brief but powerful windstorm associated with a fast moving cold front across the Urban Corridor and adjacent plains during in the evening. Peak wind gusts ranging from 58 to 71 mph downed trees and power lines which damaged homes and vehicles. Several temporary structures were also damaged. Approximately fifty thousand were left without power in the Denver…Fort Collins and Greeley areas. Some schools were closed the following day until power could be restored. Around the Denver area…peak wind gusts included: 69 mph in Golden…64 mph at Littleton…62 mph at Buckley AFB and in Denver…near the intersection of Walnut St. and Interstate 25…and Longmont; 59 mph at Centennial Airport…58 mph at Denver City Park… Highlands Ranch. At Denver International Airport…a peak wind gust to 35 mph was observed from the northwest. In 1908…a moist…heavy…wet snowfall totaled 13.0 inches in downtown Denver over the 3 days. Rain from early morning on the 17th changed to snow by late afternoon and continued through the late morning of the 19th. Due to temperatures in the 30’s and melting…the most snow on the ground was only 5.0 inches at 6:00 pm on the 18th. Northwest to northeast winds were sustained between 12 and 20 mph during the storm. Precipitation totaled 1.82 inches. In 1875…the haze was so dense that the mountains were not visible from downtown Denver for most of the day. In 1937…a vigorous cold front produced north winds sustained to 32 mph with gusts to 41 mph. Rain and snow totaled 0.16 inch. Post-frontal snowfall of 0.8 inch was the only snowfall of the month. In 1960…post-frontal upslope rain changed to snow. Snowfall was 2.2 inches at Stapleton Airport where precipitation (rain and melted snow) totaled 1.58 inches. In 1971…wind gusts to 48 mph were recorded in downtown Boulder. West winds gusted to 30 mph at Stapleton International Airport. In 1999…heavy snow developed in the foothills west of metro Denver with lesser amounts across the city. Snowfall totals included: 7 inches near Nederland…6 inches in Boulder…and 5 inches at Chief Hosa. Only 1.2 inches of snow were measured at the site of the former Stapleton International Airport. In 2003…an extended warm spell resulted in 5 new temperature records. The high temperature of 84 degrees on the 18th equaled the record high for the date. High temperatures of 86 degrees on the 19th…83 degrees on the 21st…and 84 degrees on the 22nd were record highs for the dates. Low temperature of 49 degrees on the 23rd was a record high minimum for the date. Low temperatures during the period were in the 40’s and lower 50’s. In 1887…northwest winds sustained to 42 mph were recorded in the city. In 1982…3 to 6 inches of snow fell over northwest metro Denver…including Boulder. Only 1.2 inches of snowfall were recorded at Stapleton International Airport where north winds gusted to 35 mph. This was the first measurable snowfall of the season. In 1990…an early winter storm dumped heavy snow across metro Denver. Snowfall amounts ranged from 4 to 8 inches in the foothills above 6500 feet elevation…4 to 7 inches in the Castle Rock area…and 2 to 5 inches across most of metro Denver and Boulder. Snowfall totaled 3.6 inches at Stapleton International Airport where northwest winds gusting to 48 mph kicked up some blowing dust shortly after a cold frontal passage on the 19th. However… Temperatures were warm enough to keep most roadways wet and slushy at lower elevations. In 1906…heavy snowfall totaled 22.7 inches in the city over the 5 days. Rain changed to snow on the evening of the 19th…and snow continued through the late afternoon of the 23rd. The heaviest amount of snowfall…16.0 inches…fell from 8:00 pm on the 20th to 8:00 pm on the 22nd. The most snow on the ground was 13.3 inches on the evening of the 23rd. This was the first snow of the season and the only snow of the month. Winds during the storm were from the north at sustained speeds of 20 to 30 mph each day. Temperatures during the storm were generally in the 20’s. In 1878…between 3:00 pm and 4:00 pm wind speeds averaged 48 mph with a maximum 1 minute sustained velocity to 96 mph at both 3:27 pm and 3:48 pm in downtown Denver. This is the highest sustained wind speed ever recorded in the city. In 1986…a rare late October thunderstorm produced 3/4 inch diameter hail at centennial airport. Hail piled up 2 1/2 inches deep…causing some street flooding in south metro Denver. In 2007…a storm system brought heavy snow to the southern Denver suburbs as well as the palmer divide south of Denver. Storm totals included: 7.5 inches near Castle Rock…lone tree and greenwood village…with 6.5 inches at Elizabeth. Snow drifts up to 2 feet deep were observed 6 miles south-southwest of Elizabeth. In the Denver Stapleton area…2.0 inches of snow was observed. In 1936…5.5 inches of snow fell over downtown Denver. Most of the snow…4.5 inches…fell on the 20th. In 1920…the rare event of snow from a thunderstorm occurred in the city during the evening. Brilliant flashes of lightning and loud peals of thunder were first noted at 7:35 pm. Light rain began falling at 8:30 pm…and light moist snow began falling a few minutes later. Some soft hail was also seen falling with the rain and snow…but both melted almost as fast as they fell. The hail only continued for a few minutes…and the rain and snow ceased about 9:40 pm. The snowfall was the first to occur in Denver this season. The amount of precipitation at the station measured only 0.01 inch…but heavier amounts were reported from other parts of the city. Snowfall was only a trace. In 1978…heavy rain on the 21st changed to snow by daybreak on the 22nd and continued the rest of the day. This was the first measurable snowfall of the season…but totaled only 1.7 inches at Stapleton International Airport where east winds gusted to 29 mph. While only a trace of snow covered the ground…precipitation totaled 1.27 inches. This entry was posted on Sunday, October 15th, 2017 at 7:37pm MDT and is filed under Weather History. You can follow any responses to this entry through the RSS 2.0 feed. You can skip to the end and leave a response. Pinging is currently not allowed.